The National Science Foundation’s Major Research Instrumentation (MRI) program provides funds for the acquisition or development of science or engineering instruments for research or research training. Because applications to the program are limited, the OVPR conducts an internal competition to determine which proposals will be certified to represent Baylor with a full proposal to the NSF. Internal pre-proposals are due to the OVPR on Dec. 11, 2014. Click here for information and instructions on submitting pre-proposals for the MRI program. 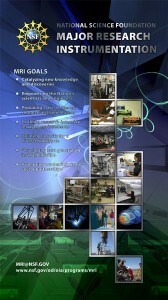 Click here for more information about the NSF MRI program.